We carry nuts in a variety of finishes: plain, zinc, stainless steel and hot dip galvanized. We also carry a full selection of standard and metric nuts in course thread and fine thread. If you need a locking nut, jam nut or coupling nut for attaching thread rod we carry it. We carry nuts in a variety of finishes: plain, zinc, stainless steel and hot dip galvanized. We also carry a full selection of standard and metric nuts in course thread and fine thread. Find the specialized threaded nut you need in the right size, finish, grade and properties from Magnosphere. Choose a wing nut for finger adjustment or a lock nut for hard-to-reach areas. A hex nut is also useful in tight corners because of the shape it offers your tools. Or pick a coupling nut that will link two threaded rods. Make Grainger your one-stop shop for all the threaded nut varieties your industrial projects and jobs require. 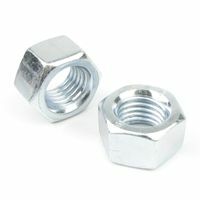 Nuts are a fastener with an internally threaded hole. They are almost exclusively used to mate with a bolt that has the correct threading pattern. Nuts and bolts work together to hold materials together by creating a temporary joint. Although the idea seems simple, nuts can be a complex product as they are offered in a variety of shapes and sizes for a wide range of purposes. Most nuts are installed with a wrench, socket or driver, but certain types, such as knurled and wing nuts, are installed by hand. In environments subject to vibrations, lock nuts can add extra tension to an assembly to prevent accidental back off. For the most part, standard hex nuts work well with many household applications. Square nuts were the standard in the past due to their ease of manufacturing, but as methods of making nuts has progressed the six-sided hex nut has become the standard used. A six-sided nut allows for more entry points on the nut. This allows a wrench to work more efficiently in tight spaces. Square nuts are still used today in situations where extreme torque is required. Four sides have a much higher tolerance to stripping than their six sided sibling. 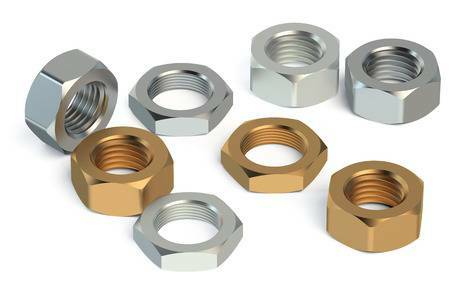 Overall, nuts can be found in a wide range of varieties which can suit needs from household applications all the way to industrial standard requirements. Online-shop for high-quality fasteners such as screws wood applications screws metric / inch nuts, washers, etc. The products are an excellent complement to our pot magnets, magnets with countersunk hole etc. The metal discs can be used as a counterpart to our magnets. Magnosphere range of fasteners is among the largest offerings, including standard and non-standard items in various sizes and with various coatings. Continual monitoring the range is a ‘given’ at Magnosphere. This comes mainly from new or changed customer requirements. Builders and contractors understand the importance of reliable hardware down to each individual nut. Whatever your project, it is always smart to use nuts and bolts of the highest quality. Strength and resistance to corrosion matter at every level of your project. From nuts and bolts to rivets and spacers, the right hardware can make all the difference. At Fastener Superstore, we have built our business around offering our customers quality bulk nuts and bolts, and we stand behind the quality of our products. Our customers know that they can trust Magnosphere for their hardware and fastener needs. We offer an enormous range of options and are happy to serve as your one-stop shop for fasteners of all kinds, including nuts, bolts, washers, rivets, standoffs and more. As a manufacturer or contractor, you know the difference it makes to have everything you need under one roof for easy ordering and quick turnaround.